Darcy Pitman, Redmond, Oregon passed away July 1, 2017 from natural causes. He was 98. Darcy was born, raised and lived most of his life in the Molalla, Oregon area before moving to Castle Rock, Washington and then retiring to Redmond, Oregon. He was preceded in death by his wife of 56 years, Ethel A. (Holt) Pitman and his second wife of 14 years, Lucille (Sowa, Kokel) Pitman. Darcy’s parents were Vernon and Theresa Pitman. Siblings included three brothers, (Elliot, Willis and Duane) and two sisters, (Joyce Wyland and Colleen Wyland). As he often marveled, “It wasn’t supposed to be, but I outlived them all.” Darcy and Ethel’s life together produced two children, Theresa R. Pitman (Leon Meals), Powell Butte, Oregon; Dexter R. Pitman (Verna), Pocatello, Idaho, six grandchildren, fourteen great-grandchildren and one great-great-grandchild. Darcy was a professional timber faller transcending the “Bull of the Woods” era of big timber logging in the Willamette Valley and Cascade Mt. Range of western Oregon. He began logging at age 14, partnering on the end of a crosscut saw with his father when horses hauled out the old growth Douglas Fir wider across then a man stood tall and felled and bucked to log lengths by shoulder power. 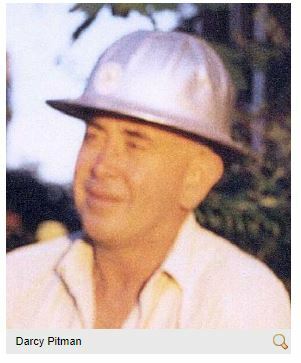 He prevailed in the timber industry as it “powered up” and unionized with many adventures along the way. He ended his timber falling days as “Bull Buck” at Camp Baker, Castle Rock, Washington shortly after the volcanic eruption of Mt. St. Helens and the scaling back of Weyerhauser Timber Company’s operations. Darcy had fast hands and strong shoulders, an excellent skill set for a logger in the rough and tumble “Bull Buck” era of personnel management. 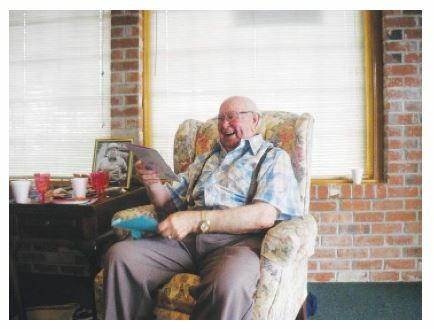 His skilled story telling captured his life with color and detail growing up in logging camps, and boxing and funning as a young man around Portland’s water front and Molalla. He was a patient and successful fisherman, hunter, baseball player and fan (Go Mariners! ), unbeatable card player, loyal to family, friends and the underdog, and a man of his word. Darcy was a long time member of the Grand Lodge Oregon Masons beginning that “man and Mason” fraternization in 1940. With Darcy’s passing, so passes one of the few remaining representatives of the historic timber industry and of course those unique Americans of strong character we describe as the “Greatest Generation.” Darcy will be missed. A Mass of Christian Burial for Darcy will be held Monday, July 10, at 11 am, at St. Thomas Catholic Church, 1720 NW 19th St, Redmond, Oregon with a reception following the service at his home. His cremated remains will be laid to rest Saturday, July 29, 10 am, with a graveside service at the - Adams Cemetery, 32840 S Adams Cemetery Road, Molalla, Oregon. A light brunch will be provided at the cemetery following the ceremony for one last toasting and special remembrances.